To honour Bastille Day on 14 July we held our own Fête de la Fédération at apartment 405. The specialité de la maison was Bouillabaisse followed by a very rich Chocolate and Orange Mousse. Nic wants me to put in lots of other French words that he's yelling at me, like tete-a-tete and rendezvous and aprés-ski, but I'm not going to. 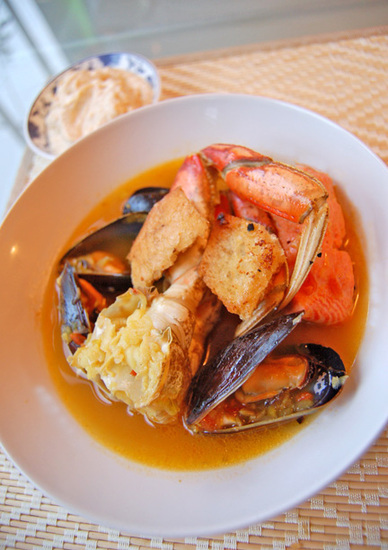 Bouillabaisse, a Provencal fish stew originates from the town of Marseille and consists of at least four different types of Mediterranean rock fish and crustaceans like mussels or small crabs. The rich seafood is balanced with a light, sweet broth that is made from fish stock given its famous red hue from saffron threads. I never fully appreciated the amount of work that goes into preparing this acclaimed dish. Bouillabaisse is no ordinary soup. It requires patience, effort and real application. In the end however the result was worth the effort. There are three major steps in the preparing of this recipe. The first is preparation of the fish stock, then the Rouille; a Saffron and Garlic Mayonnaise with croutons, and then finally the Bouillabaisse itself. Don't forget, you can always make the process easier by just buying fish stock from your local fish shop which is what I will do next time. Wash the fish head and carcass in cold water. Chop the carcass into 3 x 4 inch pieces. Heat the butter in a large heavy-based pot and fry the onion, celery and leek. Cook gently for about 5 minutes ensuring not to brown the vegetables. Add the Fish head and carcass. Cover with the 8 cups of cold water. Add the Bouquet Garni and 1 cup of wine. Bring to the boil and then turn down heat to a simmer and cover partially. Simmer for 2 hours. Once the broth has cooled, strain the soup through a strainer and store in the fridge until needed. Cut the white part of the bread up into small squares. Keep the crusts of the bread stick for frying. Soak the white bread in the fish broth for 5 minutes and then squeeze the liquid out. Meanwhile, crush the garlic and salt with a mortar and pestle. Add the soaked bread, garlic, egg yolks, Saffron and Chili Powder to a blender or food processor. Start to blend and slowly add the olive oil in a stream. Blend well and then refrigerate for an hour. **The next step can be done right before you prepare the Bouillabaisse. Heat up the butter in a small fry pan on a low heat. Brush the remaining crusts with the butter and then fry gently until the edges crisp. Set Aside. Warm 1/4 cup of wine and then steep the Saffron threads in it. Marinate the fish in 1/4 cup of olive oil and half the minced garlic for an hour in the fridge. Clean the Shellfish. Gently fry the leeks and celery in about 2 tbs of oil for 10 minutes. Add the tomatoes, remaining garlic, bouquet garni, fennel seeds and orange rind. Add the fish broth and Saffron steeped in Wine. Season with salt and pepper. Bring to the boil then reduce the heat and simmer for 40 minutes. Get the seafood ready and bring the broth back to the boil. Add the crab, the fish and turn the heat down slightly so the liquid it still bubbling. Cover and cook for about 5 minutes. Add the mussels. Boil for another 2 minutes. Shake the pot from side to side. Stir in the tomato paste gently. Remove the seafood with a slotted spoon and place in serving bowls. Then carefully pour the broth over the bowls through a sieve. Meanwhile fry the bread and then serve with Rouille to accompany the Bouillabaisse. Bon Appetit and thank god that it's over!